Yipes!! Terrific capture and what a shadow shot for the day!! Hope you have a great weekend! What a great shot! Where was it taken Diane? Soft Shadow of the Pink Pixie, come and see. Love the tiny shadows on each and every plant leaf. Great effect! Is it a croc? Or an alligator? I can never tell. I'll nelieve you, I don't need to investigate by getting close to it! terrific shot!! i really love it! This is a great photo, and yes, I would be watching very carefully. 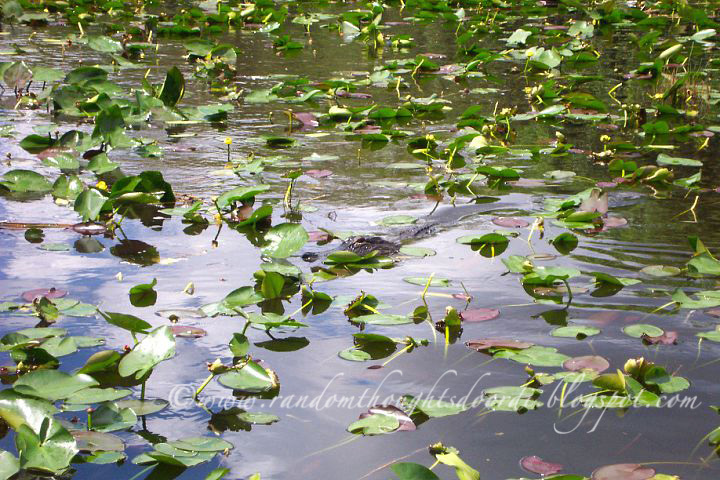 I completely missed the crocodile/alligator at first, because I was so intent on looking at the water lilies!